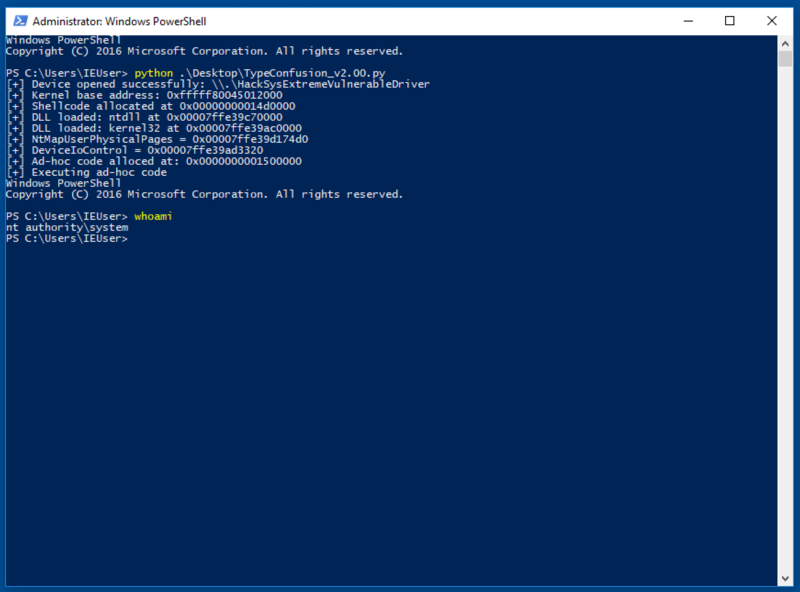 In this post I’ll elaborate on a method - what I call Shadow ROP in this post - of delivering a ROP chain from the User Space to the Kernel Stack on Windows 10 x64. I think this method is generically useful for Ring 0 exploitations where you get control of the execution flow. I started learning Ring 0 exploit a few feeks ago. As I know many folks are unfamiliar with topics in this field like I was, we start with some basics of Ring 0 exploitations, but I assume we are familiar with the concept of ROP. There are two major exploitable bug classes that we generally target in Ring 0 exploit: The class that allows an attacker to read/write arbitrary data in the Kernel Space (Write-What-Where) and the class that allows an attacker to control the execution flow (instruction pointer) of a thread in the Kernel Space. Our focus is the latter. This includes Stack Buffer Overflow, Use After Free, etc. There exist other bug classes of course, but they’re outside the scope of this post. There are at least three exploit mitigations in place that we should take into account: Kernel Address Space Layout Randomization (KASLR), Supervisor Mode Execution Prevention (SMEP) and Kernel Data Execution Prevention (DEP), all of which are enabled by default on Windows 10. KASLR is dead in practice because there are multiple ways for processes of Medium integrity level to leak the base address of the Kernel and drivers. SMEP is a more powerful feature. It prevents an attacker to directly jump to an address in the User Space, which the attacker has full control of. Furthermore, most of data used in the Kernel Space isn’t executable due to the Kernel DEP. Our general strategy to bypass SMEP is to somehow disable it before jumping onto the shellcode in the User Space. Return Oriented Programming (ROP) is a popular technique, which is a successor of ret2libc invented to bypass DEP. As the Kernel image is large enough to find gadgets, and assuming we know the base address of the Kernel, it’s easy to construct a ROP chain to disable SMEP by flipping off the 21th bit of the CR4 register. Such a ROP chain is as simple as shown below in Python. Here the problem is how to deliver the ROP chain to the Kernel Space and how to make the stack pointer RSP point to the ROP chain to get it to work. This is trivial, for instance, in the case of simple Stack Buffer Overflow bug because our data is copied on the stack buffer, but is less trivial in other cases like Use After Free. In the Microsoft x64 calling convention, it is the caller’s responsibility to allocate 32 bytes of “shadow space” on the stack right before calling the function (regardless of the actual number of parameters used), and to pop the stack after the call. The shadow space is used to spill RCX, RDX, R8, and R9, but must be made available to all functions, even those with fewer than four parameters. The point is that for every function call the 0x20 bytes of space called “shadow space” is created regardless of whether the callee actually uses all of its space or not (the caller doesn’t care). If only a part of the shadow space is used, the rest of it is left uninitialized. In 2011, j00ru discovered such a powerful technique of Spack Spraying using nt!NtMapUserPhysicalPages. With this technique, we can spray at least 0x2000 bytes of arbitray data on the Kernel Stack. That means we can put arbitray data on uninitialized part of a shadow space if it’s in the range of spraying. The theory is simple. First we split a ROP chain into pieces. Then we put each piece of the ROP chain on the uninitialized part of a shadow space and chain the pieces together to achieve our goal, which is to disable SMEP and jump to the shellcode in this case. We have to take care not to call any syscall between spraying with nt!NtMapUserPhysicalPages and triggering a bug because it can clobber the sprayed data and our ROP chain on the Kernel Stack. This can be tricky if we choose to implement our exploit using a scripting language like Python because it can call syscalls under the hood for example to interact with the Heap, which clobber the ROP chain and break our exploit. Let’s assume we’re trying to exploit a Type Confusion bug in HEVD v2.00 by HackSysTeam just for demonstration as this is one of the simplest bug implemented in HEVD, though our technique can also be applied to other bugs in HEVD. It simply calls a function pointer provided by a user (due to the Type Confusion bug) via DeviceIoControl. Here controlling the instruction pointer is trivial, but it doesn’t provide us a way to copy our payload to the Kernel Stack or Kernel Pool directly. This is a situation our method comes in handy. First let’s see what happens if we spray 0x2000 bytes of pattern below generated with Metasploit and attempt to trigger the bug. 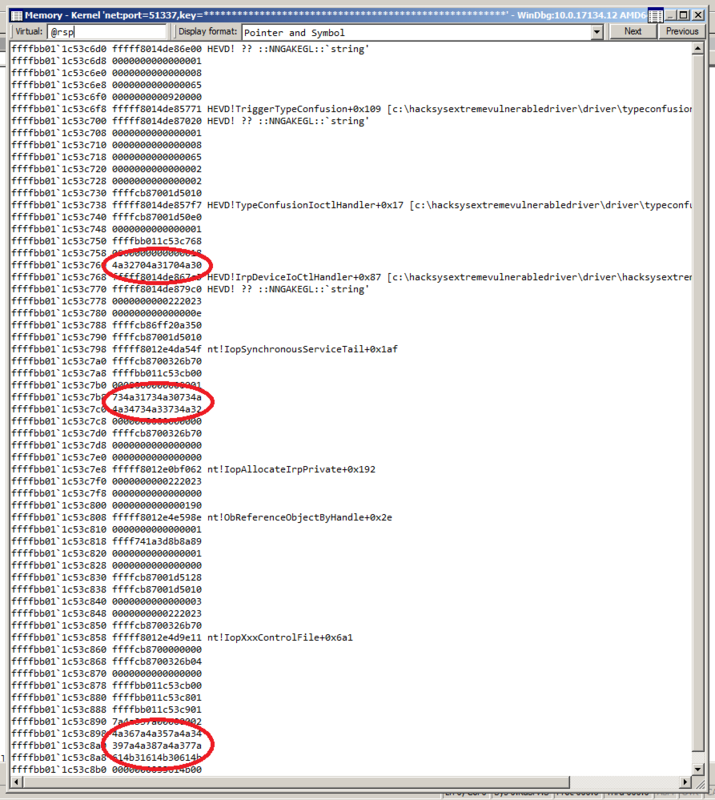 The screenshot of WinDBG below shows the layout of the stack at the moment the bug is about to be triggered. We can see some sub patterns (circled red) of the sprayed pattern have survived without being clobbered. These are the stepping stones for our exploit. By calculating offsets of these sub patterns in the pattern, we know exactly where to put our ROP gadgets. We can find more and more candidates to put our ROP gadgets by scrolling down the stack (I mean, to a higher address). The entire ROP chain is like below on Windows 10 x64 v1703. In my ROP chain, I used four shadow spaces and three long jumps between them. I put my final PoC on GitHub.